One of the electronic appliances that I plan to buy is the home theater. My husband and I are still waiting for the turnover of our house and lot. Nowadays, minimalist is the modern approach in interior designing. I like to apply minimalist design in some parts of the house to save some space. Living and family room would be minimalist. With minimalist design in the family room, the home theater should be simplified. 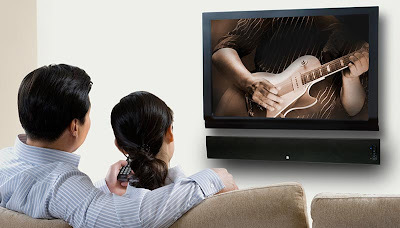 Aside from the Flat LCD TV or LED TV, HDTV Soundbar Speaker is a good combination for the minimalist home theater in the family room. It is a Soundbar Speaker and Wireless Subwoofer with Virtual Surround Sound and Bluetooth. You can play wirelessly and the good thing about this is that it can be program with your existing TV remote. You can use your iphone or IPAD to play wirelessly through bluetooth. As a mom, it will make my household cleaning convenient because I do not have to worry for the wire connections. The Subwoofer is wireless so I can placed it anywhere in the room. It will be a relaxing home theater when you have this setup. This entry was posted in Technology and tagged Cool Soundbar speaker and wireless Subwoofer, home theater simplified, Relaxing Soundbar speaker and wireless Subwoofer. Bookmark the permalink. Great post how about some more tv sound bar reviews I find them to be a great enhancer for Tv sound.